While there’s absolutely nothing wrong with white potatoes (really! ), sweet potatoes are certainly the king of the Paleo-friendly carb list. And their good press is completely deserved: these tasty tubers contain a surprising variety of different vitamins, minerals, and antioxidants – along with a healthy serving of Paleo carbs. They’re not the most common dish to see on the American dinner table, though, so learning how to cook with them can be a little intimidating. But there’s really nothing to fear: you can cook a sweet potato just like you’d cook a white potato, there are enough different varieties to keep your meals constantly interesting, and the results are as healthy as they are delicious. In terms of taste, the orange sweet potatoes are softer and sweeter; the other varieties are drier and starchier. Many grocery stores only sell the orange potatoes, but you’ll often find the other types at Asian markets. Note that both white and sweet potatoes can look very similar on the outside. “White potatoes” are white on the inside, but they can be all different colors on the outside. And some sweet potatoes also have very pale flesh that’s almost white. So be sure you read the labels carefully! 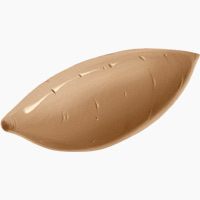 If you really can’t tell what it is, a surefire test is to buy just one, take it home, and bake it. Take one bite, and you’ll immediately be able to identify it by taste. Then come the yams. Most “yams” sold in grocery stores are actually sweet potatoes: the name “yam” was adopted around the time of the Civil War to refer to the orange varieties of sweet potatoes, because most people at the time were used to the paler ones. Now it’s just a persistent labeling error: botanically, the orange sweet potatoes are not related to true yams at all. Unlike sweet potatoes (which come from South America), true yams are native to Africa, and if you saw a real yam, you’d never confuse it with any kind of potato. True yams have white flesh and rough, brown, bark-like skin. They’re typically sold pre-cut into sections because they can get truly enormous, up to 7 feet long. You’re very unlikely to encounter a botanical yam in an American supermarket, so it’s a safe bet that anything labeled “yam” is actually just a slightly different species of sweet potato. 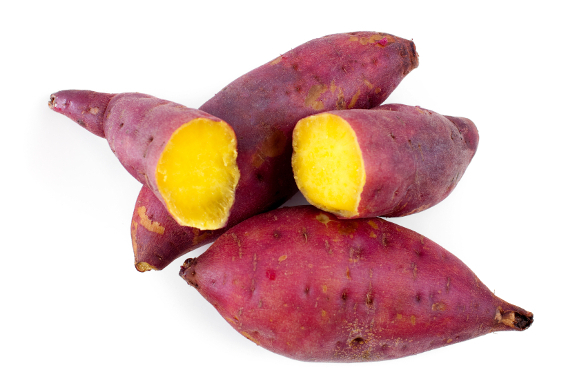 Japanese sweet potatoes: purple skin and butter-colored flesh. Now that you’re all caught up on sweet potato biology, it’s time to learn what these colorful vegetables can do for you. The sweet potato’s biggest claim to fame is vitamin A, but in fact this isn’t such a big deal, because the vitamin A in sweet potatoes is locked up in a plant form called beta-carotene, which is only inefficiently converted to true vitamin A. Better sources of vitamin A include meat – especially liver – and eggs. What’s more impressive about sweet potatoes is their high content of other nutrients. They’re full of Vitamins C, B3, B5, and B6, manganese, potassium, and copper; they’re also high in fiber. Most people have no need to worry about this, but anyone following the autoimmune protocol should also know that sweet potatoes are completely OK because they’re botanically unrelated to white potatoes (which are out on the autoimmune protocol because they’re nightshades). The various colors of sweet potatoes also indicate the variety of antioxidants they contain. The orange ones get their color from the beta-carotene, but the purple kind have a different type of antioxidants called anthocyanins. Unlike other anthocyanin-containing foods, like eggplant or blueberries, sweet potatoes have these antioxidants in the flesh as well as the skin, so they’re a much more concentrated source. As usual with nutrient-dense foods, you’ll get the most out of all this good stuff if you eat your sweet potatoes with some fat: this helps you absorb the fat-soluble vitamins, and also makes the drier varieties a lot tastier. With every food, we have to take the good with the bad, and sweet potatoes don’t get a pass on this rule. The “bad” here isn’t terribly damning, but it’s something to be aware of: sweet potatoes are moderately high in oxalates, a group of antinutrients that can prevent mineral absorption (especially calcium) and may be linked to kidney stones or gallbladder problems. On the other hand, the evidence for this causing problems at normal intake levels in humans (rather than rats) is actually fairly sparse, and there’s no convincing evidence that people without kidney problems have anything to worry about. So if you’ve always enjoyed sweet potatoes without any problems, don’t get scared off them just for this reason. The hands-down easiest sweet potato recipe takes almost no effort at all. Grab your potato, poke a few holes in the skin with a fork, and pop it in the microwave for 4-5 minutes on each side. If you have a little more time before dinner is due, you can also rub them with a healthy Paleo fat, prick the skins, and roast them in the oven – this takes longer, but it gives you crispy skins at the end. Add some butter and a sprinkle of cinnamon, and enjoy! Or enjoy them in a cottage pie, a frittata, a salad, or a casserole! Sweet potatoes are endlessly versatile and go well with sweet, savory, and spicy tastes. You can substitute them into almost any recipe that calls for white potatoes, or swap them for winter squash like butternut and hubbard squash. Of course, as with any Paleo food, sweet potatoes aren’t required. Nobody has to eat them – even if you want some more starches to fuel a tough workout schedule. But they’re very cheap, delicious, and easy for even the most time-crunched multitasker to make, so if you haven’t gotten on the sweet potato train already, you might want to start!